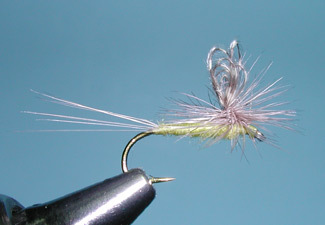 Notes: The parachute dun (Paraduns) differs from a standard dun due to the hackle being wound in a horizontal mannner. The pattern is said to originate in the 1930's by A.C. Mills of New York. 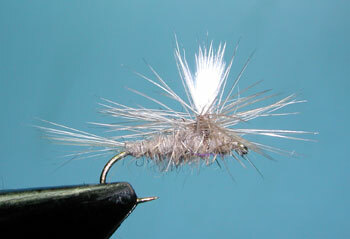 The hackle is usually wound around some kind of wing or post material such as calf hair, turkey flats, or other feather. 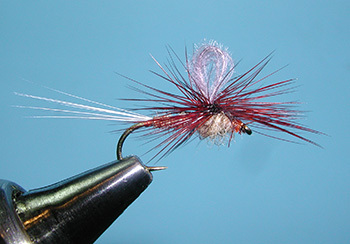 Tying a parachute dun has many advantages over the standard dun. The parachute will often increase the ability of the fly to land upright on the water with a wing that is very visible. The fly will ride lower in the water film which will more closely resemble that of the naturals. 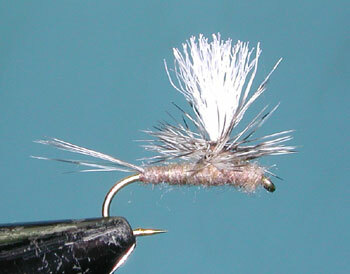 Parachutes are often tied with a hackle size that is one size greater than that tied for standard duns. This gives the fly a "parachute" effect and also increases it's stability. A usefull modification of the parachute dun is the loopwing pattern that was introduced by Andre Puyans. The loopwing gives the silhouette of the wing but is very lightweight since the wings are hollow. Puyans first used Mallard Flank to form the loops but went to an Antron Yarn due to the greater durability. 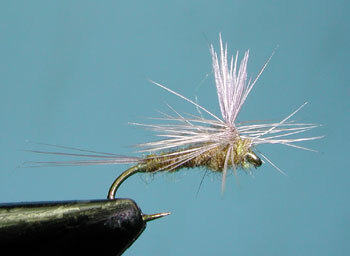 The wing is kept sparse with 6 fibers used for flies up to #16 and 4 fibers for flies that are smaller. Other materials used for loopwings are wing quills, stripped hackle stems, Float Vis, and monofilament line. Gary Borger created a veined variation of Puyan's Loop Wing by adjusting the individual barbs of the Mallard Flank producing different sizes of loops within the larger outer loop. Another usefull modification is to use a colored Antron Yarn for the wing post. This will greatly assist in spotting the fly during it's drift. 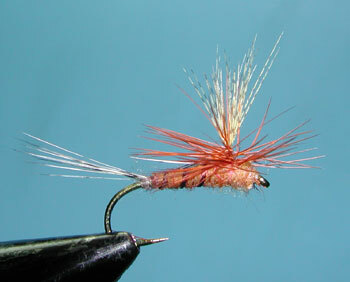 Neale Streeks (Flyfishing and Fly Tying Journal, Summer 2011) introduced a Two Tone PMD Dun that has this type of wing post and has been quite successfull on the Missouri River in Montana. The two tone is the blend of colors within the body, he uses Sulphur Orange coloration on the abdomen and Pale Olive (Pale Morning Dun) for the thorax. He adds that there are spinner falls in which the PMD have a rusty appearance, similar to the March Brown paradun, tying these colors to a size 14-20. The main point is that colors will vary with PMDs and don't lock yourself into just one coloration. 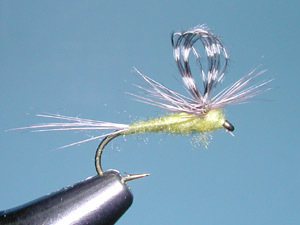 Paraduns can also be tied to represent many other mayflies besides PMD's. Just change the coloration and size to fit the mayfly. Examples within the variations are BWO Paradun, Green Drake Paradun, March Brown Paradun, and Hare's Ear Paradun (for Callibaetis). Al Troth of Dillon, Montana came up with the Gulper Special in 1971 while fishing the callibaetis hatch on Hebgen Lake in southwest Montana. The term "Gulper" comes from the large rainbows and browns which would cruise the surface of the lake gulping down large quantities of tricos, callibaetis, and midges. The sound of the gulp would resonate across the lake. This pattern differs from earlier parachutes in that Al chose to use white or gray Poly Yarn for the wing post. This material has a number of advantages over calf tail or feather wings. It repells water so that the fly will float longer. 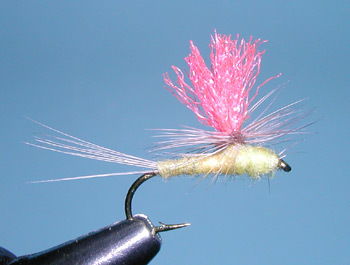 It can be used successfully for smaller mayflies, such as tricos and callibaetis, since the poly yarn provides less bulk to the fly. Since the material comes in different colors, Al also experimented with color choice so that light colors would be used against dark backdrops or dark colors would be used to improve the silhouette on flat water conditions. 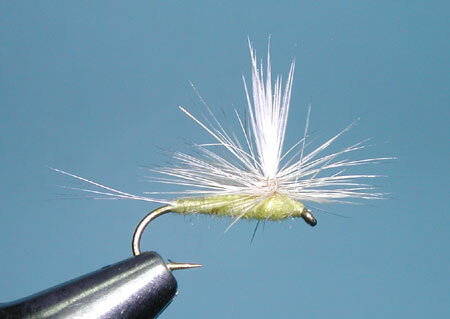 Al preferred to tie his Gulpers with a hackle that was one size smaller than the hook and tied his original pattern with dark brown Beaver dubbing. 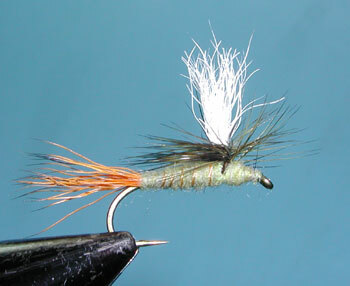 Today, most Gulper patterns use a tan dubbing color for the Callibaetis and an olive color for the Tricos. Use floatant and fish the back-eddies in slow to moderate flowing water. Prefered variations are Pale Morning Duns, March Browns, and Blue Wing Olives.